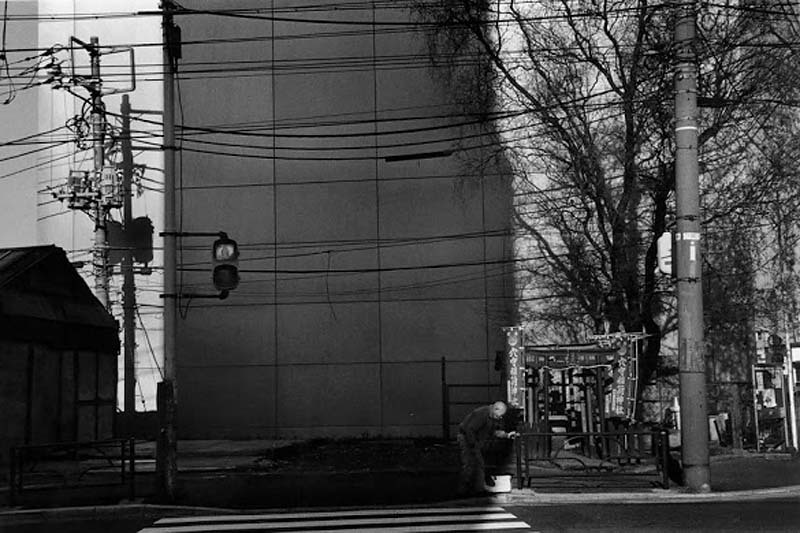 Why does Tokyo look so unfamiliar in Nagano Shigeichi’s photographs? He used no slights of hand; followed no special methodology. His influences were the usual ones for his generation — William Eugene Smith, Life magazine, celebrated Japanese photojournalists like Kimura Ihei and Fujimoto Shihachi. He didn’t have pretentions of being an art photographer, a title with the elasticity for all kinds of oddities. His pictures usually appeared in Japanese news magazines, and he worked in film and television. Now nearing eighty, with a successful career spanning decades, Shigeichi has attained the status of “national treasure” in Japan. (A 2000 retrospective exhibit at the Tokyo Metropolitan Museum of Photography was the gavel banging on any further judgments of his career.) He is Appreciated and Renowed; he is a Documentary Photographer of Historical Importance. There would be no need to ever look at any of his pictures again if they did not counteract the banality of this reputation with such oblique and persistent wildness. Shigeichi describes himself as a documentary photographer. The answer of what he is documenting, however, grows more opaque the longer you look at his pictures. On the surface, they are entertaining and vibrant, full of the high contrasts and grainy light commonly associated with postwar Japanese photography. The subject matter, too, is so typical of street photography that it verges on cliche. (Here we have the architecture of parking lots, there the overhead tangle of electrical wires, oh, and here’s the quiet desperation on the faces of jostled people passing by). But stare long enough at Shigeichi’s tipsy composition, unusual forms, and distorted shapes, and a different story emerges. 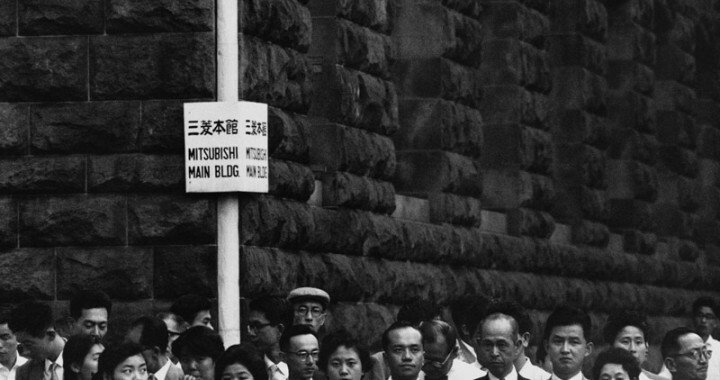 Considered together, his pictures write an unseen narrative of Tokyo during the last half of the 20th century. To find the thread, we must first find the action. What is active in Shigeichi’s pictures turns out to be that which should be still: the inanimate objects in his pictures heave with life. Tree leaves strangle cars. Electrical lines choke the sky. Neon lights explode against glass like fire. 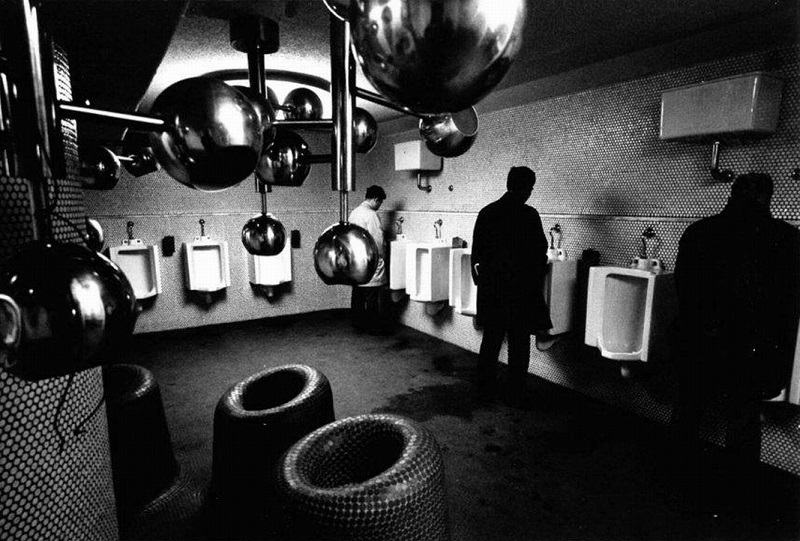 The polished light fixtures in the men’s bathroom ogle the salarymen hunched at the urinals, swallowing not only their bodies but the left half of the frame. A surge of pedestrians waiting at an intersection look less like individuals than mere variations of the enormous bricks in the wall behind them. A child pokes his head out of the rooftop of a car, and is devoured by the flash of light popping off of the window beneath him. Meanwhile, the small, scurrying people of Tokyo seem static. Volcanic activity explodes all around them — yet they are mere pebbles tumbling about, lost in thought or in the posturing of their social codes. Their blindness is Shigeichi’s opportunity for intimacy and empathy. He’s not a photographer with an agenda. He’s as bewildered as the people in his pictures are. “It was as if I were looking at the streets and the people on them from another planet, from a point of view far away,” he once said. The statement reveals something about what Shigeichi is doing. The omniscient viewpoint doesn’t make him a god, though the unexplained — and, more importantly, the unexplainable — play an outsized role in his vision of Tokyo. He begins with what he can see, and his interest is detached, scientific. He speaks often of physiology when he talks about his work. “The photography must physiologically express our important ideas,” he said. It’s an interesting word for a photographer whose insensate surroundings have so much movement. Nagano is trying to chart what a biologically appropriate response to what he calls “the age in which I live” might look like. It is instructive, then, to consider the facts of the era he was intent on capturing. In 1920, the year Nagano was born, Japan was both culturally isolated and globally dominant. It was still dominated by an ancient imperial system, but it had emerged from World War One as the dominant colonial power in Asia and one of the most advanced military and industrial nations in the world. Political instability in the 1930s, along with a rise in nationalism and militarism, carried Japan straight into the second World War — after which a once-proud and independent island nation found itself hobbled by occupation (by its hated rival, the U.S.) and every manner of devastation. The American occupation laid the groundwork for an economic miracle — three decades of astounding breakneck growth that made Japan the second-largest world economy by the 1980s. Tokyo reflected this larger narrative in every way. In the 1920s, Tokyo was decimated in the 1920s by earthquake, fire, and race riots. It was destroyed again by bombing during World War Two. Its miraculous rebuilding — by 1955, it had 7 million residents — happened primarily because of the work of Tokyo residents. Such is the history of Japan during the decades that Nagano was coming of age as a person and a photographer. Yet these facts on their face are so dramatic in the speed of their cylicality that they barely believable. To be met with such a rapid series of shocks and recoveries after centuries of slow change and fierce independence is history, but it may be lived as absurdity. So absurdity, then, is what Nagano was capturing — and not just absurdity but the physiology of absurdity But how do you express the natural condition of absurdity through pictures? The answer that Nagano has found is quite simple: he expresses it through myth. Or rather, perhaps it is more accurate to say that he expresses it by recognizing the mythological aspects of the reality in which he, and everyone in Tokyo, is living. “I strongly believe that documentary photography is based on the gap between the commonly-accepted myth and the individual recognition,” he once said. That’s why Nagano’s Tokyo is a city of anthropomorphized objects. The natural expression for myth is the life and action of unseen spirits. Looking again at that picture of the tree swallowing a car — that which is rooted eating that which was created to move — I can’t help but think of the Greek and Roman myths of transformation. One of the well-known myths is that of the running nymph, Dryope, transformed into a poplar tree: “Her words, her life, together ceased to flow;/Her changeling boughs long held her body’s glow,” wrote the great poet Ovid of Dryope’s sudden mutation from being into stasis. Horrifying as Dryope’s tale is, do we have greater security than she does? Will all of our modern comforts protect us from being destroyed by nature? How can we be sure that history will not devour us? 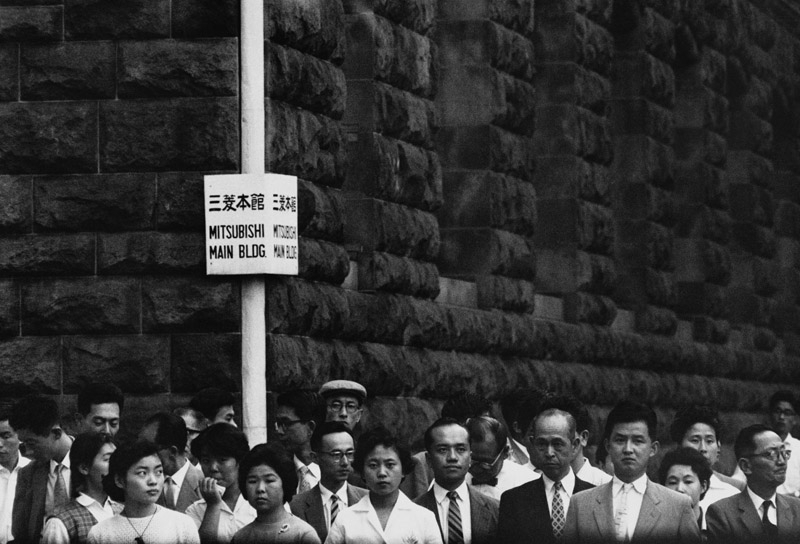 Nagano’s photographs provoke these questions, simply by reflecting an unseen narrative of uproarious change. Like Ovid, Nagano knows it’s not his role to argue with fate. He’s simply telling us what’s going on. “My photography has the function of recording the subject and letting people recognize it,” said Nagano. If his Tokyo is a strange land of mythical spirits, it’s only because the city has gone through its metamorphoses before his camera’s eye. Caille Millner is the author of a memoir, The Golden Road: Notes on my Gentrification. She is an editorial writer and cultural columnist at the San Francisco Chronicle. Posted in Essays and tagged Caille Milner, Japan, Japanese Artist, Nagano Shigeichi, Street Photography.